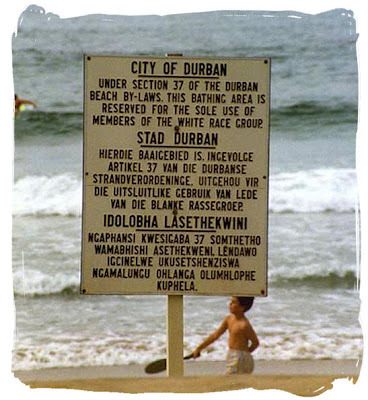 Apartheid was a social and political policy of racial segregation and discrimination enforced by the white minority government in South Africa from 1948 to 1994. Racial segregation in South Africa began in colonial times, but apartheid as an official policy was introduced following the general election of 1948. New legislation classified people into racial groups ("black", "white", "coloured", and "Indian"), and residential areas were segregated by means of forced removals. From 1958, Blacks were deprived of their citizenship, legally becoming citizens of one of ten tribally based self-governing homelands called bantustans, four of which became nominally independent states. The government segregated education, medical care, and other public services, and provided black people with services inferior to those of whites. During this time thousands of people were beaten, jailed, and often killed in acts of protest against this racist government. Nelson Mandela was arrested and jailed for twenty-seven years while Steve Biko was killed while in custody for several days.